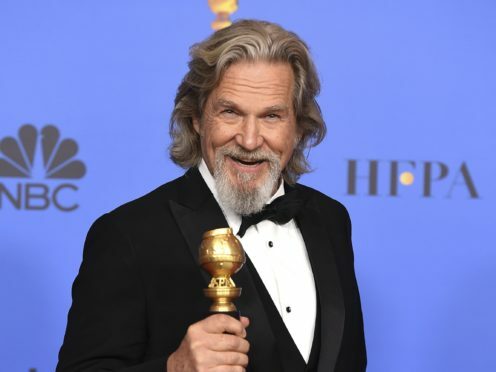 During his 2010 Golden Globes acceptance speech, Jeff Bridges spoke about “chipping away” at his status as one of Hollywood’s most underrated actors. He picked up a best actor prize that night before winning an Academy Award less than two months later, finally receiving the recognition many thought was long overdue. And his ascension to the pantheon of great actors was complete on Sunday when he was honoured with Cecil B DeMille lifetime achievement award at the Golden Globes, in recognition of his “incredible impact on the world of entertainment”. Bridges joins previous winners including Oprah Winfrey, Morgan Freeman, Meryl Streep, Jodie Foster and Barbra Streisand. While on stage accepting the accolade, Bridges, 69, paid tribute to the role for which he is perhaps best known – as Jeffrey ‘The Dude’ Lebowski in 1998 cult classic The Big Lebowski. Bridges’ career highlight came in 2010, with both Academy Award and Golden Globe wins for best actor for his performance as Otis ‘Bad’ Blake in Crazy Heart. He was born into a prominent showbusiness family in Los Angeles in 1949. His father was the actor Lloyd Bridges while his mother was actress Dorothy Bridges. His brother, Beau, is also an actor. During his Oscar acceptance speech, Bridges dedicated the award to his parents. Bridges made his screen debut before he had turned two years old, with an unaccredited appearance in 1951 drama film The Company She Keeps. He followed up with appearances on his father’s TV shows before his first big film, 1971’s The Last Picture Show, for which he earned an Academy Award nomination for best supporting actor. After that came starring turns in the 1976 King Kong remake, 1982 science fiction film Tron and John Carpenter’s Starman in 1984. The latter earned him an Oscar nod for best actor. However, the role for which he is probably most famous for came in 1998, when he starred as The Dude in the Coen Brothers’ crime comedy The Big Lebowski. Bridges played an avid bowler and slacker caught up in a case of mistaken identity. His fifth Oscar nomination arrived for his role in 2009’s Crazy Heart, which he won. Bridges was nominated again in 2011 for True Grit as well as in 2017 for Hell or High Water, though did not win either. In 2018, he appeared in thriller Bad Times At The El Royale alongside Chris Hemsworth, Jon Hamm and Dakota Johnson.